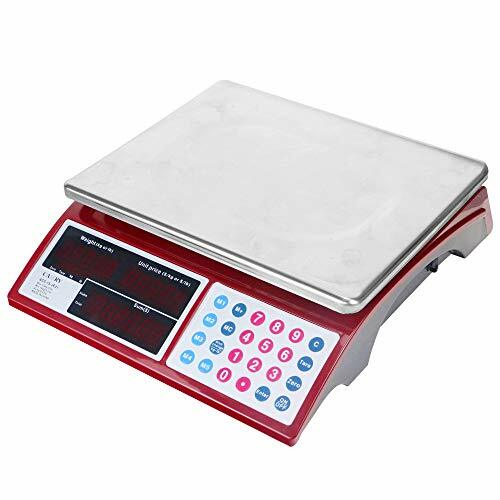 Camry 33lbs / 15kgs Digital price computing scale is an easy to use, ideal fro Cafeteria, Grocery, Deli, Restaurant, Farmer's market and more. The Max weight is 33lb/15kg and the Min weight is 0.2lb/100g while the Precision is 0.01lb/5g. This scale is not NTEP Approved and it's not for trade. This digital scale has three bright red displays shows Weight, Unit price & Total price, which to help you see your weight readings, even in dim lighting. The first display will show you the weight of what you have on the scale, the second displays the weight of each item, and the third shows the total amount of pieces you have on the scale. Five different unit price memories, and 4 unit price keys for product with LCD. This digital scale built-in rechargeable battery, Capacity: 4V 4AH,long lasting power can be used up to 3 months when fully charged. And the framework structure with pressure limit-protection is equipped with function of overloaded and low voltage indication. This digital scale has automatic energy saving mode if no operation in 10 seconds and automatic temperature compensation. Robust, Well-Constructed Scale - for Butcher Shops, Delis and Farmers or Outdoor Markets. Includes Rechargeable Battery. Please charge it when indicates low battery power. If you have any questions about this product by CAMRY, contact us by completing and submitting the form below. If you are looking for a specif part number, please include it with your message.